In the previous post, we did the Fill in the Blanks in General English for Bank exams. Today, we will do some problems on Alligation or Mixture in Quantitative Aptitude. Q: The ratios of milk to water are 5 : 1 and 8 : 6 respectively in two pots. In which ratio should they be mixed so that new ratio of milk to water is 9 : 5? 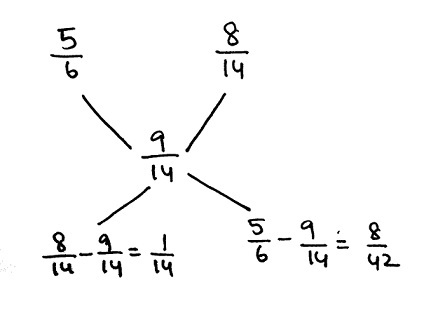 To solve this problem we use the Alligation formula. This is the actual formula. 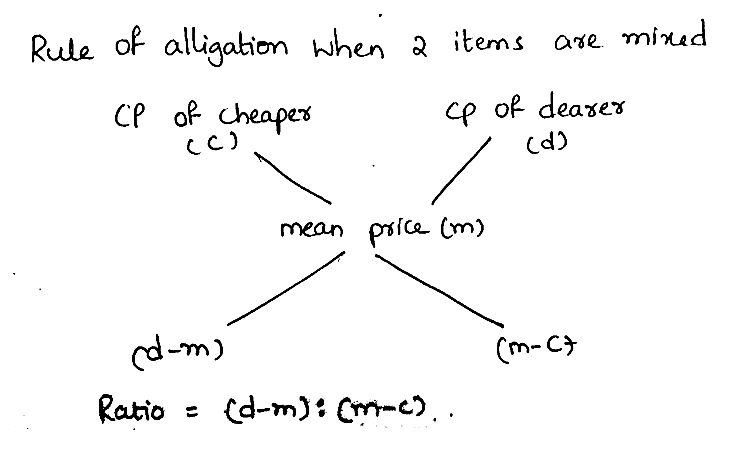 Alligation is the rule to find the ratio of the ingredients of a mixture at a certain price to get a particular price. This alligation rule is applied when finding the ratio of the ingredients in the mixture, price of the items, quantity of the item. It has three terms → Cost price of the Cheaper item c, Cost price of the Dearer item d and the Mean Price m.
Mean Price m: The cost of the unit quantity of the mixture. The formula and rule is given above. How many kilograms of sugar costing Rs. 9 per kg must be mixed with 27 kg of sugar costing Rs. 7 per kg so that there may be a gain of 10% by selling the mixture of Rs. 9.24 per kg? The milk and water in the vessel A and B are in the ratio 4 : 3 and 2 : 3 respectively. In what ratio the liquids in both the vessels be mixed to obtain a new mixture containing half milk and half water? How many kgs of wheat costing Rs. 8 per kg must be mixed with 36 kg of rice costing Rs. 5.40 per kg so that 20% gain may be obtained by selling the mixture at Rs. 7.20 per kg?